Ingrown toenails, also known as onychocryptosis, maybe caused byinjury, heredity, or poor foot structure. The symptoms are aggreviated by any source or pressure against the affected side of the toe. Ingrown toenails occur when the corners or sides of the toenail dig into the skin, and causing infection. A common ailment, ingrown toenails can be painful. Ingrown toenails start out hard, swollen, and tender. Left untreated, they may become sore, red, and infected and the skin may start to grow over the ingrown toenail. In most cases, ingrown toenails maybe treated with: Epsom salt, Betadine or Domeboro in warm water several times each day. Avoid wearing tight shoes or socks. Antibiotics are sometimes prescribed if an infection is present. Note: Please consult your physician before taking any medications. 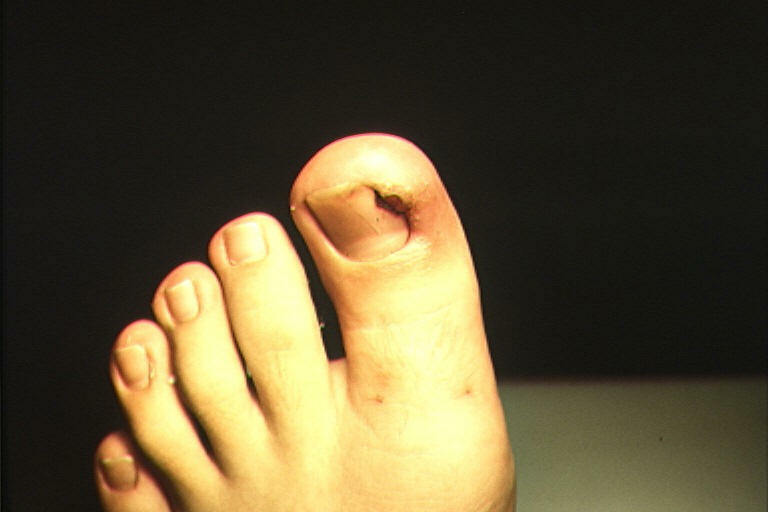 In severe cases, if an acute infection occurs, surgical removal of part of the ingrown toenail may be needed. -Trimming toenails so there is no irritation on the skin around the nail. -Ensuring that shoes and socks are not too tight and there is no source of irrtation around the nail.